Summary: The highly anticipated sequel to the New York Times bestselling novel The Rosie Project, starring the same extraordinary couple now living in New York and unexpectedly expecting their first child. Get ready to fall in love all over again. 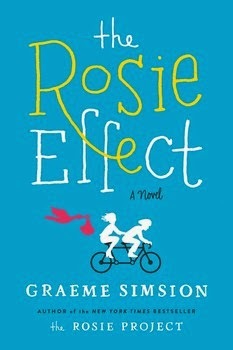 I still remember when I learned that Graeme Simsion was writing a sequel to THE ROSIE PROJECT -- I was absolutely thrilled! Like many readers, I fell in love a little with Don and Rosie and their incredibly entertaining romance. In fact, THE ROSIE PROJECT was one of my favorite books of 2013. (You can read my review here.) I laughed so much at Don, but he also touched me heart. Needless to say, I couldn't wait to see what was next in store for Don and Rosie's relationship. Well, THE ROSIE EFFECT is that book! It tells the next phase of Don and Rosie's lives, and I am 100% sure that fans of THE ROSIE PROJECT will love this book too. In THE ROSIE EFFECT, Don and Rosie have moved to New York, and (surprise, surprise!) Rosie finds herself pregnant. Don isn't quite sure what to make about the pregnancy, Rosie's new behaviors, and his ability to be a good dad. So what does Don do? He decides to research the subject like only Don can research. I don't want to give too much away, but I almost peed my pants when Don began his investigation. Suffice it to say, Don becomes a bit overwhelmed with becoming a father as well as a few other interesting tasks he takes on, and his odder than normal behavior begins to threaten his and Rosie's relationship. I adored THE ROSIE EFFECT, and of course, Don! In this novel, readers will experience the same dry sense of humor mixed with a beautiful love story; and it's just a wonderfully entertaining read. Personally, I was glad to see that Don was still Don -- you know what I mean, and I loved how desperate he was to make things right for Rosie... despite his awkward ways. It was just plain fun to read about these two and wonder if their love could endure. Don managed to get himself into quite a few messes in this novel. As a result, he began keeping secrets from Rosie. Not because he was being mean-spirited. Rather because he wanted to protect her... and himself a little. I couldn't stop laughing at how Don saw his predicaments, knowing that his wife wouldn't see them the same way. I admit there were quite a few times when I was worried that Don might not be able to recover. Fortunately, I should know that Don is nothing if not determined! THE ROSIE EFFECT would make a cute book club selection. Despite being a romantic comedy, there are quite a few topics worth discussing. There is a reading guide with sixteen questions and some ideas for enhancing your discussion. Some of the themes you might want to talk about include control, organization, sacrifice, secrets, relationships, marriage, friendships, parenting, and of course love. Overall, I highly recommend THE ROSIE EFFECT! I sure hope Mr. Simsion is busy at work with his next installment of Don and Rosie's lives! I still haven't read The Rosie Project. I need to get on that now that a sequel is out! My mom loved The Rosie Project too. I need to get to work on these books! I haven't read either but they sound perfect for adding brightness to winter. This sounds terrific! I'd like to read either of the Rosie books. I didn't race out and read this one (although I really liked the first one) because I'd heard it wasn't near as good. I probably still need to find out what happened with these two. Don is such a great character. You definitely liked this one more than I did. In fact, I couldn't even finish it. I'm glad you enjoyed it though!